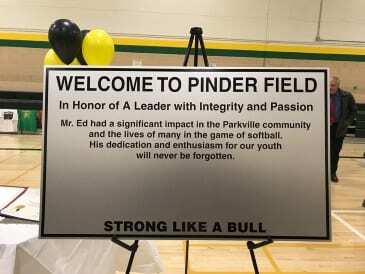 Last month, Diamond #27 at Belmont Park in Parkville was officially named “Pinder Field” in honor of Edward T. Pinder, local attorney and longtime Parkville Recreation Council leader. 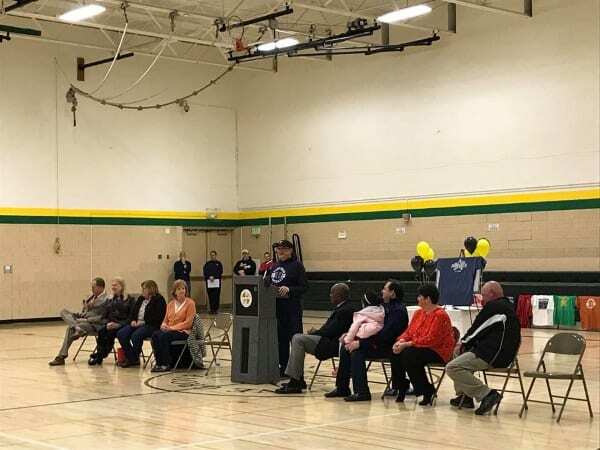 The field dedication, sponsored by Baltimore County Government and the Parkville Recreation Council, recognizes Pinder’s years of volunteer service to youth athletic programs in the community. A past president and board member emeritus of the Rec Council, Pinder served as commissioner of Parkville Softball from 1999 to 2009, but is perhaps best known for his years as a softball coach and mentor to young people. Founder of the Parkville-based law firm, Pinder Plotkin LLC, Pinder received the prestigious “Spotlight Award” from the Maryland State Bar Association in 2009 in recognition of his outstanding community leadership. He also received Congressional and Maryland General Assembly citations in 2001 for his service to the Parkville Rec Council, and a Maryland Senatorial citation in 2010, which named him Volunteer of the Year. The Maryland State Bar Association was on hand for the field dedication.